Do you know about Open Wide the World? It's such a fantastic resource for parents and educators! I've worked with Julie on a project recently, and she is so great at creating fun, educational materials. If you visit her website, you'll find tons of products, links, ideas, and more to help your children see the beauty in places around the world. Go and visit - you'll love all the free downloads she offers! 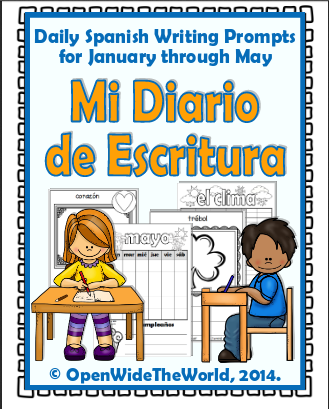 Julie is happy to participate in my Back-to-School Fiesta and has kindly offered a copy her Daily Spanish Writing Prompts for January through May "Mi diario de escritura" to TWO MommyMaestra readers!